Why is it that the weekends always go so fast? I haven't worked since Tuesday and I'm not working until tomorrow night but even so...this weekend has flown by! 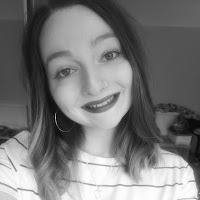 It's been a bit of a mad couple of weeks with starting my job, my graduation (more on that in a future post!) and some other personal things but hopefully things will start to settle down now. My nails are slowly growing back after I had to chop them down for training so that always helps with my motivation/inspiration. Anyway, for tonights post I have swatches and a review of a new-to-me brand. 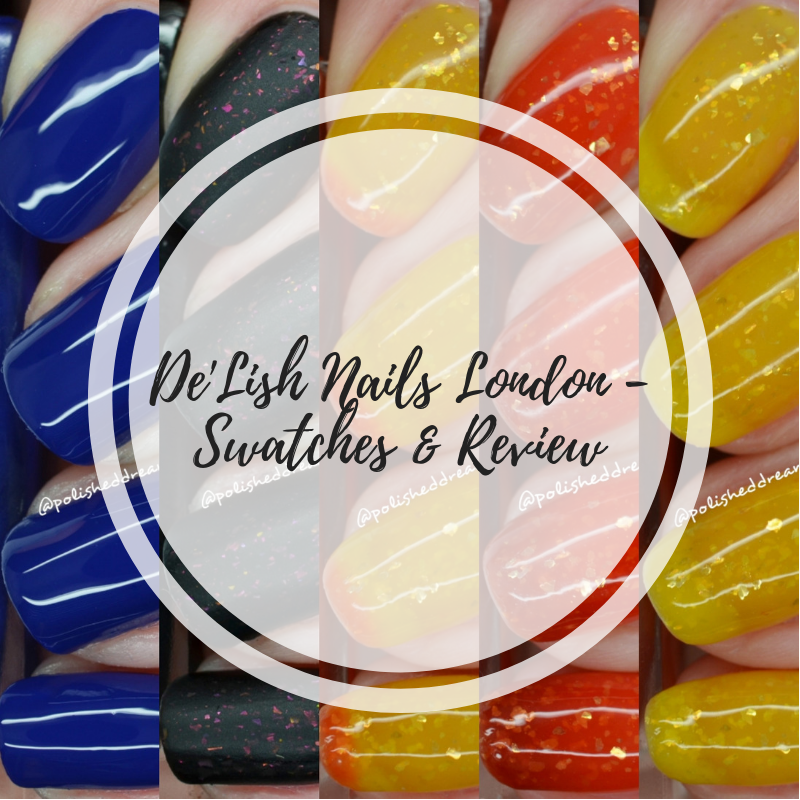 I was kindly asked to swatch some of De'Lish Nails London new collection and I was super excited when these three beauties came through my letterbox. 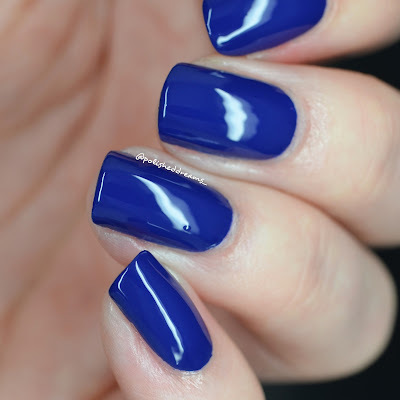 The first polish is this gorgeous blue named 'Whoops-A-Navy'. 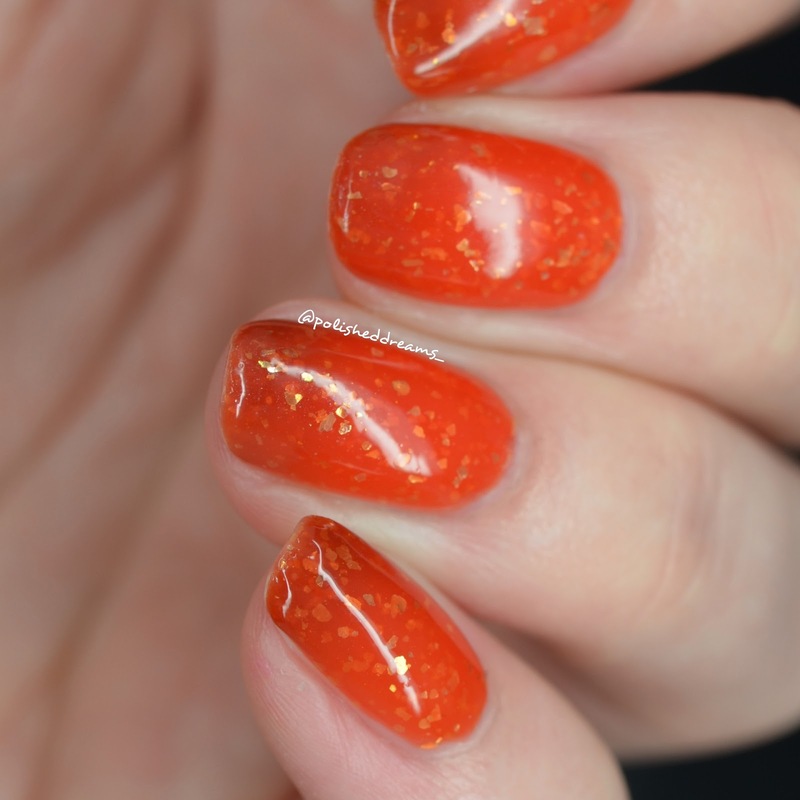 Now believe it or not, these swatches show just one coat. I know right?! 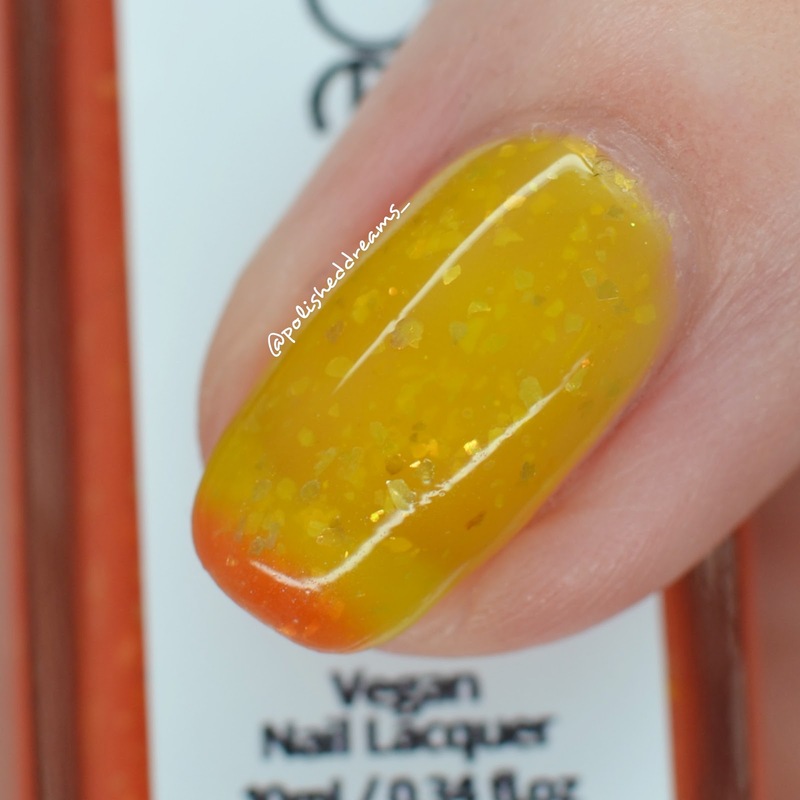 When I first received the polishes, I tested them all on one nail to see what they looked like. 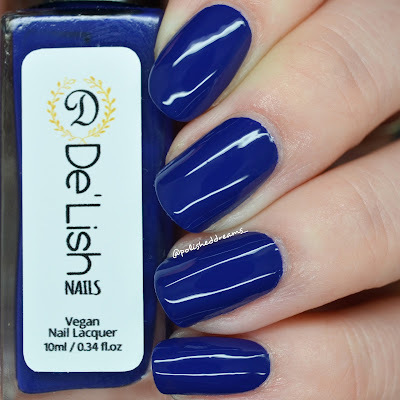 I was super impressed when this was opaque in one coat and wondered if it would be the same on all my nails. Amazingly it was! Not only is this a one coat wonder, the formula and application was perfect. It was just the right consistency, not too thick or too thin. 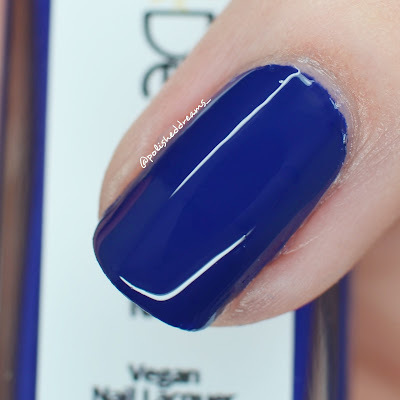 So as I've said, here we have 'Whoops-A-Navy' in one coat with topcoat. 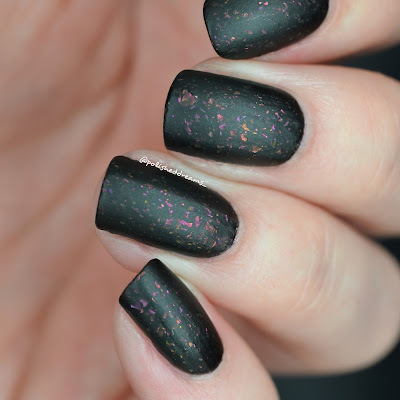 Next up we have 'Dark Matter' which is a stunning matte black with chameleon flakies. I wasn't expecting it to be matte when I first applied it so that was a pleasant surprise! I did also try putting topcoat over it but 1) my topcoat is a bit old and funky now and 2) I actually totally preferred it matte anyway. 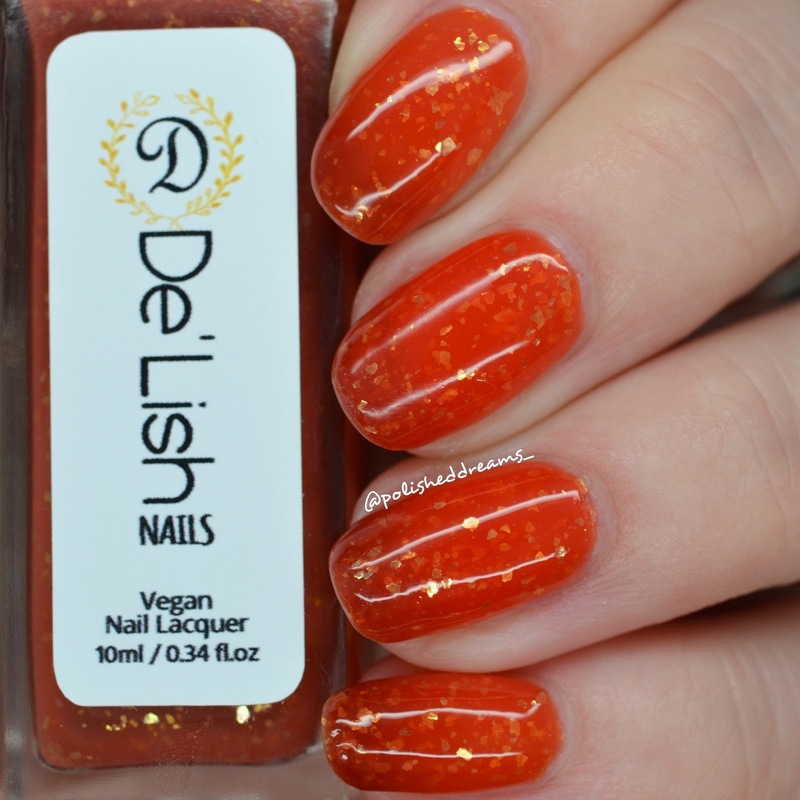 Once again this had a lovely formula so application was easy-peasy. 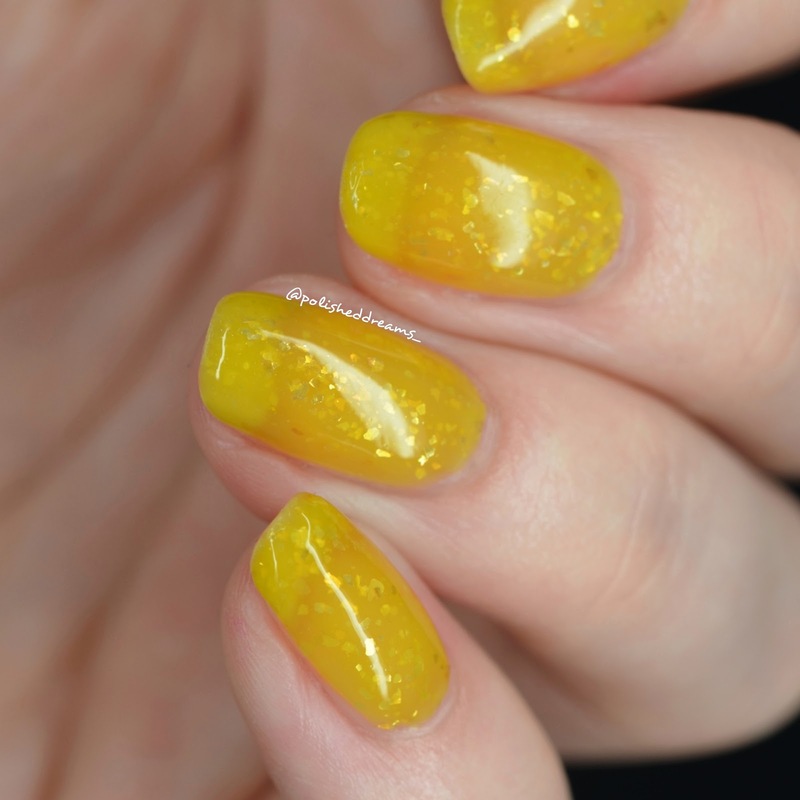 Shown here in two coats without topcoat. 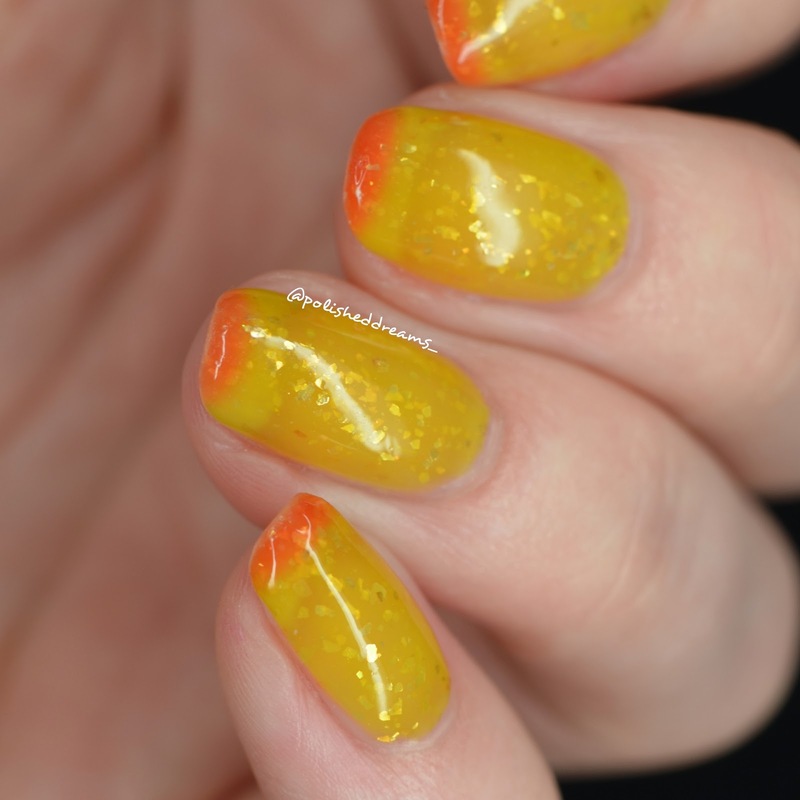 The final polish I have to share is 'Inferno', an amazing yellow/orange/red tri-thermal jelly with flakies. This started off fairly sheer but did build up with further coats. 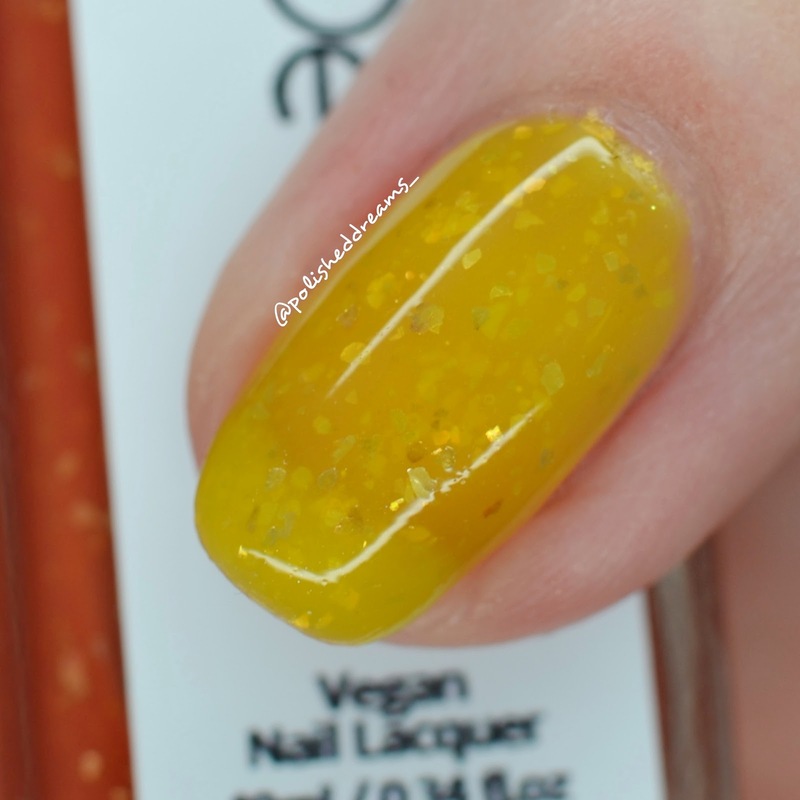 Of course you can still see my nail line when it's completely yellow but that's to be expected with a jelly polish of that shade. Aside from it's sheer-ness, this was a lovely polish and it's definitely a brilliant one to have now that we are officially in autumn! 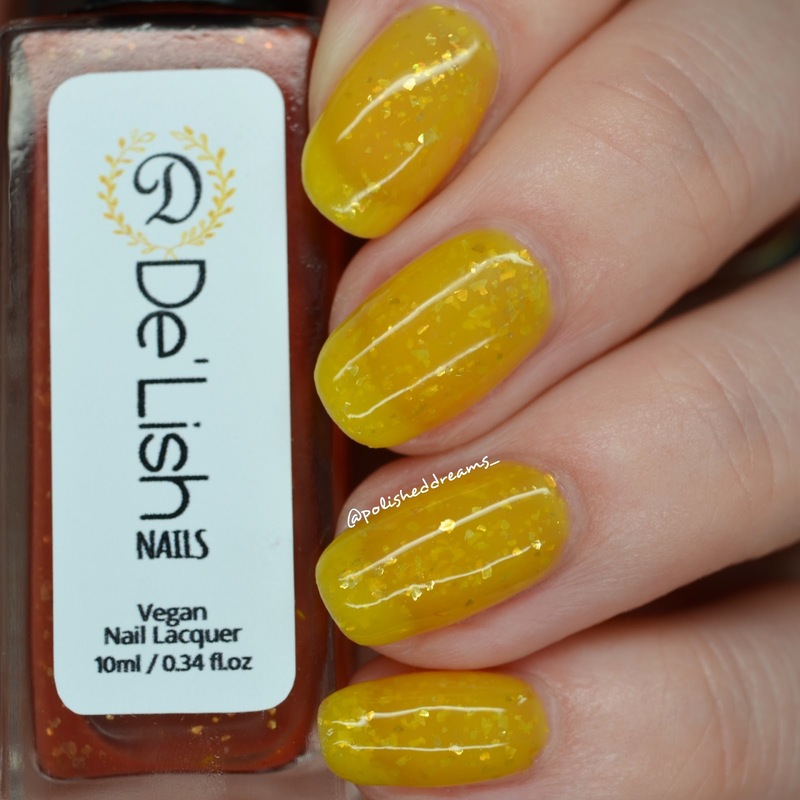 In terms of the colour transitions, the polish is bright yellow when warm and then goes from a burnt orange to deep red as it gets colder. 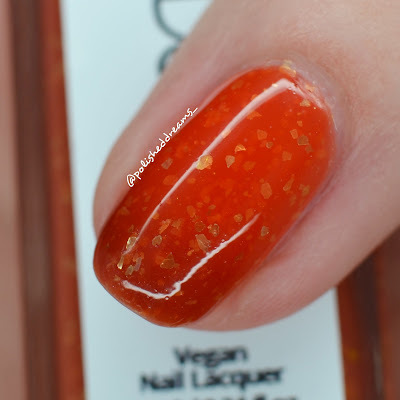 Despite standing in my freezing room in my underwear (yes, seriously), I couldn't get cold enough to show the red on it's own but you can see it in the swatch below of the orange to red transition. My swatches show three coats with topcoat. 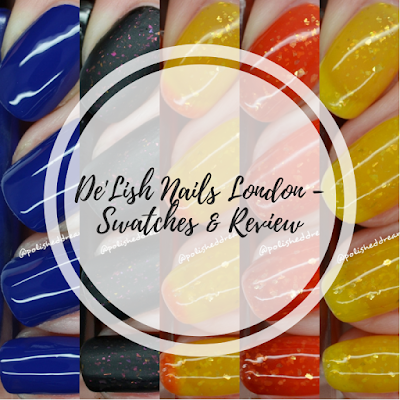 Overall I was really impressed with these polishes and they have definitely left me wanting more from De'Lish Nails London! If you like the look of these beauties then don't worry, you only have to wait a few more days as they are available on Friday 28th September! 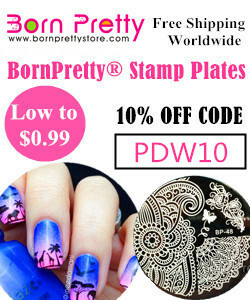 With prices ranging from £6-7 they are super affordable so don't miss out! 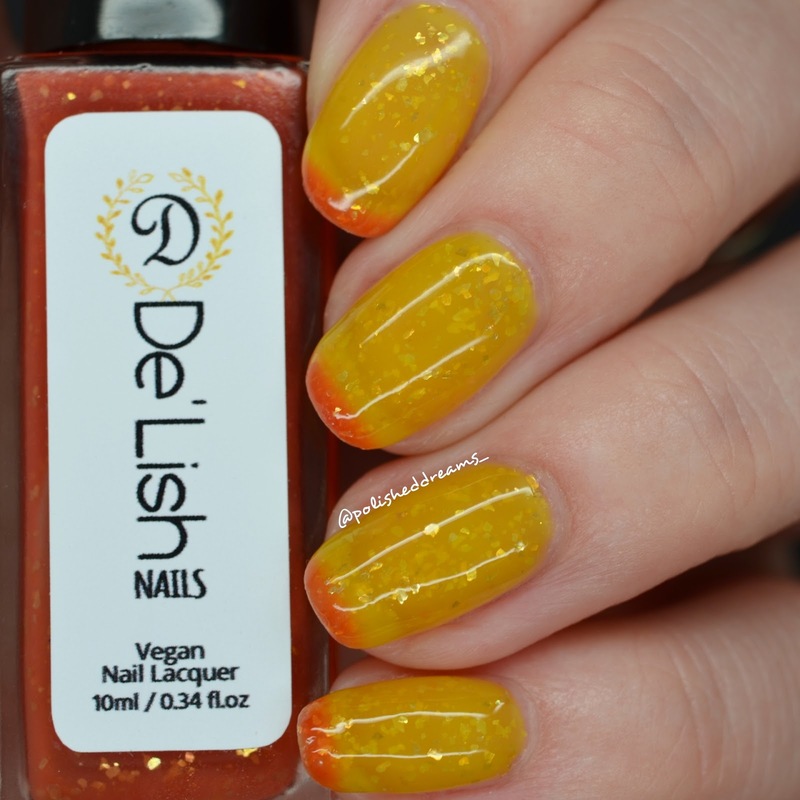 Don't forget to follow De'Lish Nails London on Instagram here to see some of the other newbies that are being released!